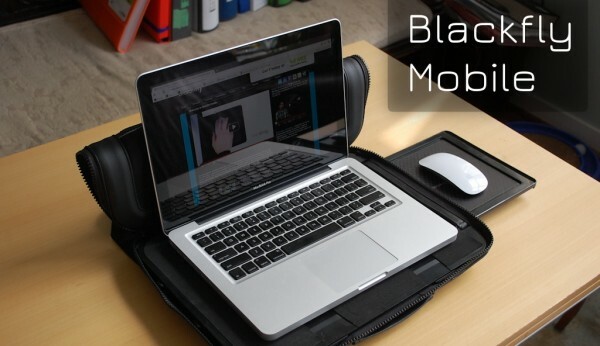 The Blackly Mobile is quite a unique offering as far as laptop bags go: not only is it designed to accomodate a 13–17“ laptop for use inside the case, but it also allows for the use of a mouse on a slide-out mousepad (called the ”Wing“). This means that you’ll be able to work on your laptop as if you were sitting right at a desk, even if all you have available is a chair and your lap. If 15- and 17” laptops are desktop-like computers in a mobile shell, then the Blackfly Mobile enables desktop-like posture and comfort…all in a mobile workstation enclosure that can be deployed in seconds. The caveat here is that the Blackfly is really best when paired with a 15 or 17“ machine. It simply feels too large and too heavy to use with a smaller machine. I’ve been using the Blackfly for a little over 10 days with my 13” MacBook Pro, and the case tends to dwarf my machine. This isn’t just an aesthetic issue either: without a tighter fit, there’s nothing keeping my 13″ MacBook Pro from slipping and sliding around the Blackfly while it’s closed. 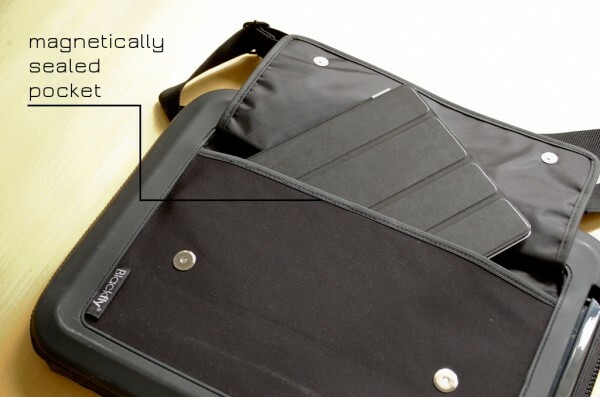 along the rear of the Blackfly is a magnetically sealed pocket for accessories, or even a 10″ tablet. This side pocket is a great idea in concept, but the first time I tried it out with my iPad at the dining room table, I lifted the Blackfly up from the wrong end (upside down) and watched in horror as my iPad flew out of the pocket and onto the floor (bouncing a few times along the way, for good measure). With that experience in mind, I’d really only recommend this extra pocket for minor accessories like cables or chargers – that magnetic seal simply isn’t secure enough to hold a tablet in place. the slide-out Wing mousepad is great, but what happens to your mouse if you sit and keep the Blackfly on an incline? You don’t want your mouse simply sliding right off on and onto the floor, and so the Blackfly comes with a set of Stabilizer stickers – foam pads with adhesive – to keep your mouse nicely in place. These stickers are very easy to apply, but a little more difficult to take off, since the adhesive tends to be stronger than the foam, resulting in a lot of ripped foam and gunk upon removal. 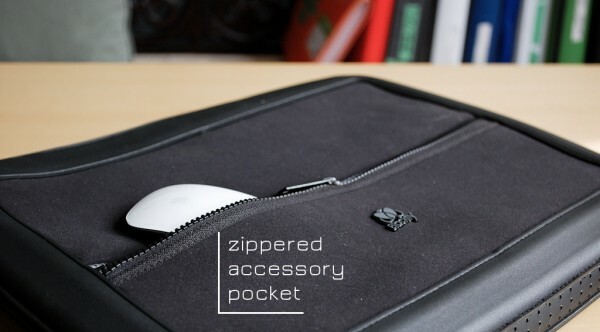 a very strong zipper frames the entire case, and it’s this zipper that you’ll manipulate every time you want to use the Blackfly. It’s pretty easy to use, but it can often get caught on the corners, which does impact the over slickness of the Blackfly’s design. The combined weight of the Blackfly and my laptop (around 8.4 lbs.) is also a bit more than I’m used to shouldering, especially when you consider that I opted for a 13″ laptop because I wanted my portable setup to remain as light as possible. That said, although my Blackfly and 13″ MBP don’t make for an ideal combo, using the two in tandem can still be quite comfortable. I tested the Blackfly primarily in two different positions: at a desk and on an incline (with the Blackfly on my lap). Using the Blackfly at a desk doesn’t really offer any distinct advantages over other cases, aside from the fact that you don’t have to take your laptop out. Typing and using the trackpad was comfortable enough, and the zippers along the edge of the Blackfly didn’t get in my way. I did find that I was better off without the Wing while seated at a desk, since deploying it required propping up the entire right side of the case. However, using my Magic Mouse with two Stabilizer stickers noticeably increased the drag while mousing on my wooden desk, so I eventually took them off. Sitting down on a chair and using your lap as a make-shift desk is quite comfortable. I found that I could sit down for about two hours at a time – feet flat on the floor, Blackfly and MBP on my lap, Wing deployed – before fatigue really set in. Using my Magic Mouse with two Stabilizer stickers kept it from sliding around unduly, and the whole case was thick enough to keep the MacBook Pro from searing my lap. I also liked how setup time really was reduced to seconds: all I had to do was unzip the case, fold the top cover in half (it seals itself with velcro), deploy the Wing, take my Magic Mouse out, and open my laptop up. Ten seconds max – not bad. I love the idea of having a mobile workstation that I can simply carry on my shoulder, but I don’t think I have the right kind of setup for the $80 Blackfly. 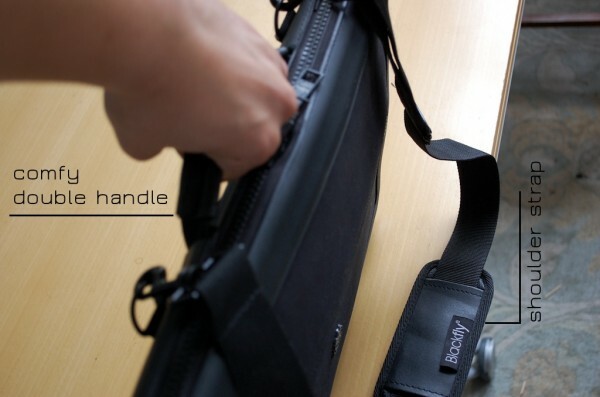 I’d need a much lighter and smaller version of this bag to use it properly with my 13″ MacBook Pro, and the one-size-fits-all approach may not be the best way to present the Blackfly. 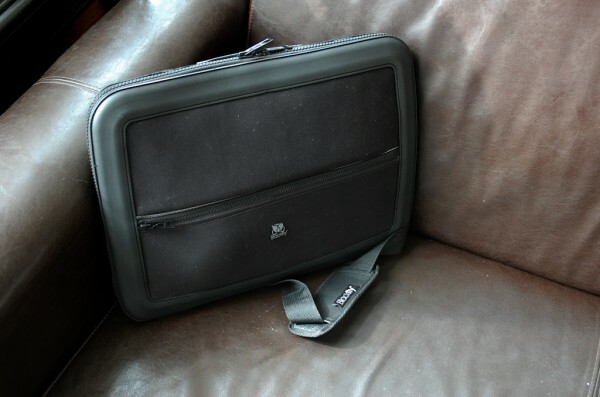 This is a bag best used in tandem with bigger, beefier laptops and for writers or designers who don’t want to compromise their capacity for mobility or productivity. In this niche category, this bag and its concept really do fly. The Blackfly was provided by Blackfly Mobile for review on iSource. For further information regarding our site’s review policies, please see the “About” page.